Almost every photographer knows how it feels to stand out in the cold and the dark, trying for hours to get that perfect shot. COOPH seems to be aware of that same issue, as its latest introduction is a photo vest that's not just very well insulated; it actually heats up. The COOPH Heatable Photo Vest looks and feels like your regular, classic photo vest. It's got that reassuringly puffy sheep-wool insulation, big pockets to store your things in, it's reversible for when you want to switch up your look from day to day, and it's a lightweight enough vest that it shouldn't hinder your movement when out and about. 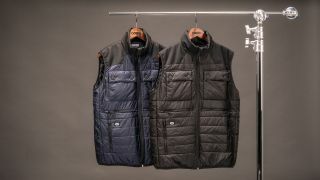 What's newsworthy about this vest, though, is that COOPH has collaborated with heated apparel specialist THERM-IC to fit an internal heating system into the vest. This system warms the hand pockets and is thus placed to cover the kidney, back and stomach areas, and it works with any rechargeable 5V battery with USB port and can run for up to approximately five hours with THERM-IC's 5200 mAh battery. As is the case with seemingly every piece of gadgetry today, the vest comes with an app, which you link to the Bluetooth dongle that comes with the vest to control the temperature via your smartphone, with functions including automatic adjustment so that it heats less when you're moving (and thus generating more body heat yourself) or stationary (thus generating less body heat). The Heatable Photo Vest is available in COOPH's online store.